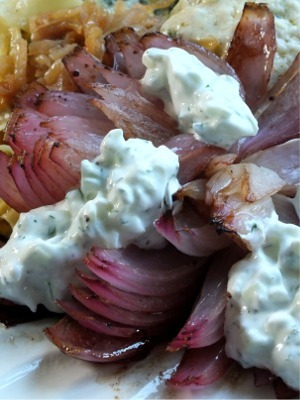 There's nothing like Greek Tzatziki Sauce with rich, spicy foods. I also use it as a sandwich spread, a dip and a sauce to accompany Healthy Blooming Onions. Over the years, I've come to make this version that incorporates Cilantro rather than Dill, and more finely diced Cucumber than usual. Until Greek yogurt became so widely available, I used to make my own version from regular yogurt. If you don't want to do this, simply use store-bought Greek plain yogurt. The night before making the Tzatziki Sauce, put a strainer over a bowl. Put five layers of paper toweling into the strainer. Spoon the yogurt on top of the paper towel in the strainer and chill over night. When you wake up in the morning, all of the excess water will have seeped out of the yogurt, leaving Greek yogurt within the strainer. Discard the yogurt water. After you seed and finely dice the Cucumber, put it on paper towels to remove as much moisture as possible. In a medium bowl, stir the lemon juice, lemon zest, minced Garlic and finely chopped Cilantro into the yogurt. Add salt and pepper to taste. Add more Cilantro if you wish. Chill for a good hour before serving. Use within three days. Keep chilled.